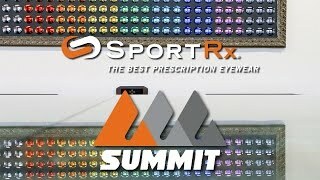 Meet Torrey: An awesome pair of sunglasses from our very own line, Summit™ by SportRx. Torrey is where fashion meets function. The super opticians at SportRx designed these sunglasses to provide you with a casual-looking frame that is complete with sport-like features. The entire inside of the frame is coated with a rubberized material for extra comfort and grip. Plus, these sunglasses give you some wrap around coverage while being super Rx-friendly. So if you're looking for something to take you from morning hike to post-workout coffee shop, Torrey is the go-to pair of casual/sport sunglasses that can give you the best of both worlds. Torrey shades have a great small-to-medium fit, and can be customized exclusively to your vision needs and sport conditions. Don't hesitate to give us a call for expert advice on prescription sport sunglasses!